Many people believe opposable thumbs are what separate man from beast, but they would be incorrect. What truly raises man to the top of the evolutionary ladder is fire. When early man first learned to harness fire he also harnessed the ability to heat his cave, cook his beast and protect himself from predators. He became the king of his world. Fire was the first and oldest tool. Although few modern humans continue to rely on the ability to start and maintain a fire for survival outdoorsmen still find it necessary to learn the age old skill of controlling the mystic flame. When spending the night afield even modern man still finds fire necessary to cook meals, for protection from animals and the elements and even comfort with friends. 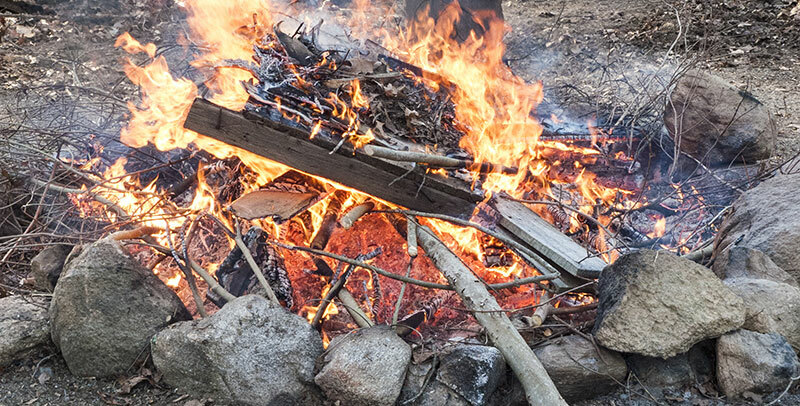 The ability to build a good burning fire will often make or break a trip, so let me take a moment to provide some simple but game changing tips. Before you strike a match you must first build the base, or fire pit, upon which the flame will burn. The purpose of this pit is twofold; first, it provides a designated and protected area for you fire void of excess moisture and protected from the element; second, it prevent your happy little fire from becoming a raging, destructive forest fire. Building this pit is as simple as 1,2,3. Clear a flat, level area away from trees, brush or other burnable material. Dig a shallow depression OR build a shallow mound of bare dirt to build your fire in or upon. Surround dirt area with low rock wall to further protect from stray embers. DO NOT use wet river rocks as they are prone to exploding when heated. The main component of any fire is the fuel. When building the perfect fire you will need three types of fuel- tinder, kindling and wood. Tinder – very fine, dry material such as twig tips, dry bark, dry grass or wood shavings meant to at as a fire starter. Birch bark is an especially good natural tender or you if you want to bring some from home, then try lint from your clothes dryer. Kindling – also known as “small stuff”, kindling is slightly larger twigs, branches or split off pieces of a larger log used as an intermediate fuel and will be ignited by the tinder. As a general rule kindling should be no larger in diameter than a pencil. Wood– this is what will keep your fires burning and the best types are dry, dead branches or small logs gathered from the ground or dead trees. Avoid wet or live woods as it will burn poorly and produce excessive smoke. Place small amount of tinder in center of fire area, loosely top with graduating size kindling followed by increasing diameter fuel. Stack material close enough to ensure continued burning but loose enough to allow easy airflow. After initial fuel catches and burns freely added larger fuel.